To start a lab just click on the screenshot. If the application does not start, have a look at our Help page. 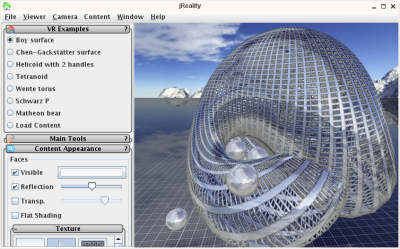 See how the JBullet physics engine has been integrated into jReality. Experience mathematical objects as physical objects: use middle mouse to shoot balls, left mouse to move an object, right mouse to apply momentum to an object and the scroll wheel to change the direction of the applied momentum. Includes real-time synthesized audio. This may require a fast computer to run smoothly. You can turn off audio, uncheck "sound" in the "Main Physics Controls" panel on the left.